Landing a massive rover on Mars has always been a challenging undertaking. 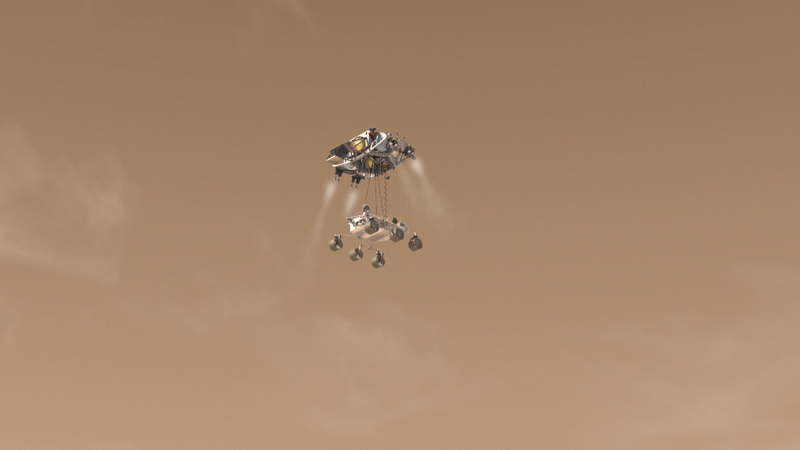 The atmosphere density limits effectiveness of rockets, parachutes and aero-braking systems.Previous rovers, such as Spirit and Opportunity, employed a landing gear based on airbags. But this time, the Mars Science Laboratory, nicknamed Curiosity, is too large and massive for this option. 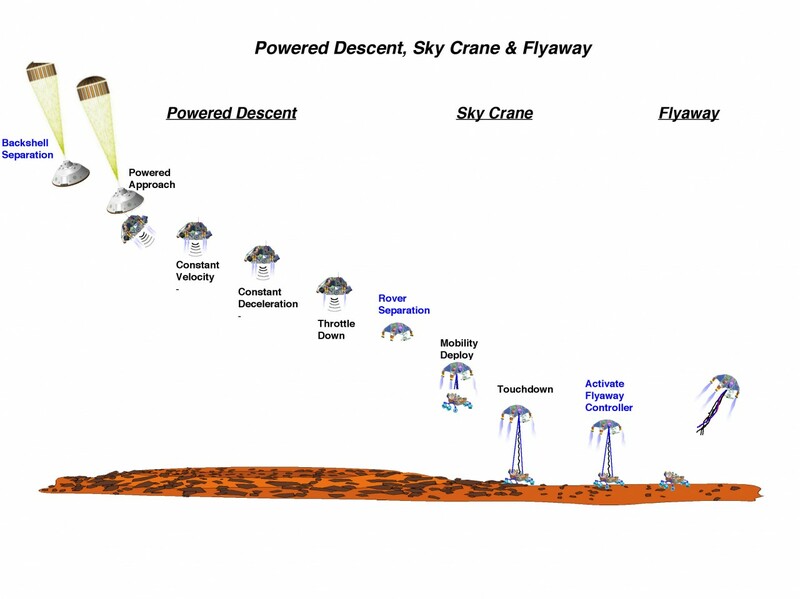 For this reason, Curiosity will be deployed on the Martian surface using an innovative four step process, which will utilize a “Sky Crane” never used on space missions. 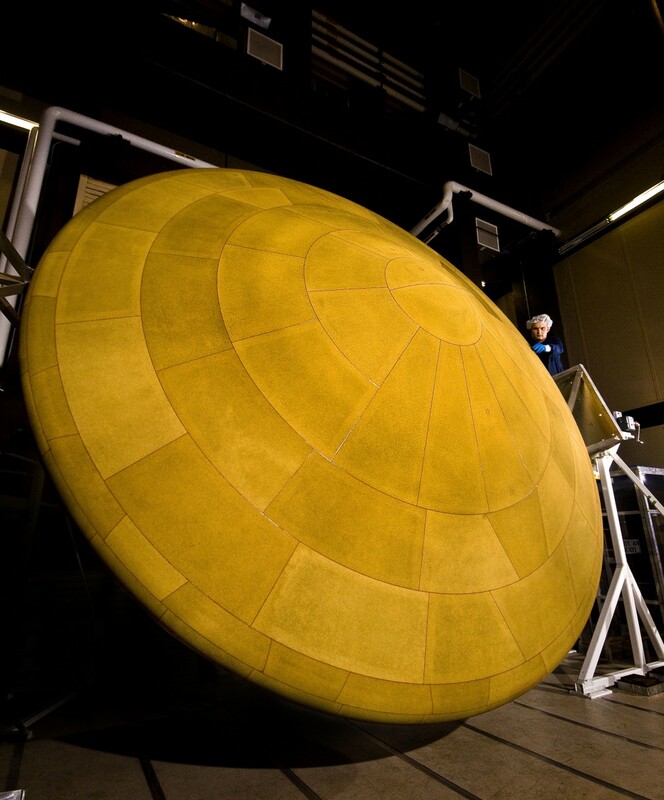 At first, the rover will travel through space folded within a protective aeroshell. Atmospheric entry will be accomplished using a 4.5m Phenolic Impregnated Carbon Ablator (PICA) heat shield, the largest heat shield ever used in space. The Martian atmosphere will slow down the aero-shell from 6 km/sec down to Mach-2, a speed that is compatible with parachute deployment. The spacecraft will feature an onboard computer and other precision landing technologies, which will provide the ability to steer the descent module toward pre-determined landing site. At about 7 km of altitude, the second phase will begin. The capsule will jettison the heat shield and deploy a supersonic parachute of 16 meters in diameter and 50 meters long. The parachute, significantly bigger than those used on previous missions, will set a new standard for future Mars exploration missions. All along entry, descent and landing, the rover will be capturing images to help the mission team to make early determinations of the landing site. In the third phase, at about 1.8 km of altitude, the rover and descent stage will be dropped out the aero-shell and will proceed to a powered descent using hydrazine rocket thrusters. Power descent has been employed before to land on Mars: the eight rockets used in MSL are in fact derived from the Viking Lander engine used in the two missions of 1976. In the third phase, the rover will change to a landing configuration, deploying the various instruments previously stowed. During deploy, phase four will begin: the descent stage will lower the rover using a “Sky Crane”, a system which uses three bridles to lower the rover and an umbilical cable to carry electrical signals between the descent stage and rover. While the vehicle has been slowed down to nearly zero velocity, the rover will be lowered until it touches the ground. Right after touchdown, the bridle will be cut, and the descent stage will move away to a crash-landing site. During the lowering phase, the rover mobility and suspension systems will be deployed, making the rover ready to work upon landing. This landing technique, which has never been employed before, will open up the deployment of even larger equipment in the future, up to a manned mission. Mars Science Laboratory will also be the first planetary mission to use precision landing techniques, improving the landing accuracy up to a range of only 20 kilometers. The launch is tentatively scheduled in November 25, 2011, in which case the landing would occur on August 6, 2012.